Light-exposed mushrooms naturally generate vitamin D, which enhances calcium absorption and bone strength. One serve of vitamin D mushrooms provides a day’s supply of this essential nutrient. Vitamin D deficiency is common in Australia, especially during winter and in the southern regions. A Sydney University study has shown that mushrooms left in direct midday sunlight can provide 100 per cent of the recommended daily intake of vitamin D.
To keep bones healthy is a blend of exercise, especially weight bearing exercise, and eating sufficient calcium and vitamin D. With all three in the right amounts, bones are likely to reach their maximum mass. Bone formation is a constant flux between bone formation and bone loss. Up until age 30 bone formation is more than bone loss so bones grow in size and density, providing the condition are right on the activity and food side. After 30 years bone mass tends to decrease, but that can be kept to a very slow rate by remaining active and eating well. From a food aspect, you need both calcium and vitamin together. You might eat enough calcium-containing foods, but without vitamin D you won’t be able to absorb that calcium. This is the reason that you need vitamin D each day, whether from the sunshine or from food. This is where mushrooms can help. Mushrooms naturally produce vitamin D when they see sunlight (or another source of UV light). Through the action of sunlight they convert their abundant ergosterol to ergocalciferol (vitamin D2). Wild mushrooms in Europe commonly have 2-40 mcg vitamin D/100g (Mattila 1994; Mattila 2002; Teichman 2007). Even store-bought mushrooms are able to generate over 20 mcg per serve after being placed in sunlight for a couple of hours in the midday sun (Simon 2011). Unfortunately, mushrooms begin to shrivel after so long in the sun so the farmers have found a way to do it conveniently on the farm. Farmers generally don’t subject their mushrooms to light other than during growing operations and harvesting, so cultivated mushrooms are low in vitamin D. If cultivated mushrooms are exposed to a short burst of ultraviolet light they quickly generate vitamin D, while retaining the good looks and nutrition of the mushroom. 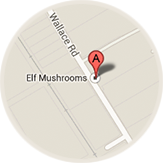 Once consumed, the vitamin D2 in mushrooms is converted to 1, 25 (OH) ergocalciferol. Both vitamin D2 and D3 act in the same way in the body. Proof of the effectiveness of light on vitamin D levels in mushrooms came from a study by the University of Western Sydney (Koyyalamudi 2009). This break-through research reveals that 1-2 seconds of a pulsed UV light source can stimulate mushrooms to naturally produce enough vitamin D for the daily needs of adults. Vitamin D Mushrooms are in supermarkets in the US and Canada, and are now available in some parts of Australia. A single 100g serve of vitamin D mushrooms provides at least the daily need for vitamin D. That’s about three button mushrooms. 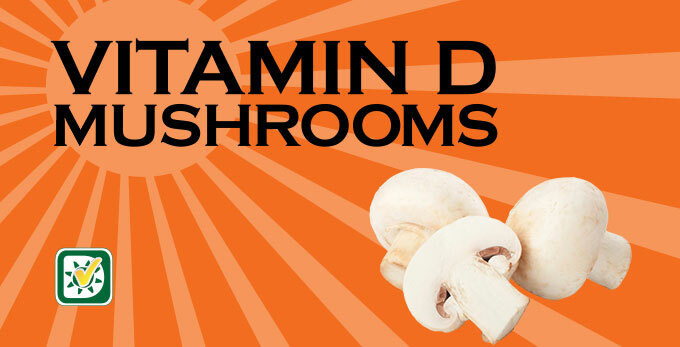 Vitamin D mushrooms are the only food to provide the day’s needs of vitamin D in a single serve. In fact, most people get barely 10% of their vitamin D from food, relying on sun exposure and supplements to make up the difference (Nowson 2012). The vitamin D in mushrooms is easy to absorb and effective in improving vitamin D status (Urbain 2011; Koyyalamudi 2009; Jasinghe 2005; Outila 1999). It also supports bone growth (Calvo 2012). A study conducted by the University of Sydney in July 2013 assessed the vitamin D levels generated when a serve of mushrooms is exposed to direct midday sunlight. Button mushrooms had 10 mcg of vitamin D after 1 hour in the sun, while the bigger cup mushrooms took about 2 hours to reach 10 mcg of vitamin D, the amount recommended for adults under 70 years. As this study was conducted in winter the times of 1-2 hours is likely to be less in the spring and autumn. The study confirmed that mushrooms generate vitamin D levels in a similar way to humans and an average serve of 100g can provide 100 per cent of an adult’s vitamin D requirement (10 mcg). There is at least an 85% retention of vitamin D in wild mushrooms after frying for five minutes (Mattila 1999), so even after cooking most of the vitamin D remains in the mushroom. Furthermore, there is very little loss of vitamin D2 when mushrooms are refrigerated for eight days (Koyyalamudi 2009) or even three months (Mattila 1999). Vitamin D mushrooms will become a simple and delicious way for Australians to get 100% of their daily vitamin D needs, especially if they are unable to get adequate sun exposure. Research has linked vitamin D to a rapidly increasing number of benefits beyond healthy bones and the prevention of rickets and osteoporosis. The benefits of normal vitamin D levels include a decreased risk of heart disease, type 2 diabetes, hypertension and colorectal cancer (Lee 2008; Wang 2008; Dobnig 2008). Vitamin D deficiency is commonplace in Australia with about one third of us having insufficient levels. Deficiency is more common during winter and in people living in southern part of the country, About four in 10 women and three in 10 men are deficient in summer, increasing to about six in 10 women and nearly 4 in ten men deficient during the winter. If you can’t get sufficient sun-exposure during the day, especially in winter, then include vitamin D mushrooms in your diet each day. If you would like to find out more about Mushrooms and Vitamin D, please check out our video Interview. Dependent on AMGA.